Hillary Clinton: Remarks to the Press at the U.N. I think we saw once again the deep concern that the international community has over the situation in Syria and the determination to act, to try to bring an end to the killing and terrible abuses that is ongoing. We will have a concerted effort over the next days to reach agreement in the Security Council to put forth a resolution that sends a message to President Assad and his regime. I think it was made abundantly clear that the Arab League has played an essential leadership role, and we want to support the Arab League’s position, and we want to underscore that there is no intention to seek any authority or to pursue any kind of military intervention. This is a crisis that should be resolved peacefully. In order to do that, the United States believes that President Assad should step away and permit others to begin the process of negotiating a political transition that will lead to elections and the fulfillment of the aspirations and universal human rights of the Syrian people. So I am pleased at the statements that were made. And even those who have some concerns said today that they understand the need to act and that we do have to support what the Arab League has worked so hard to achieve. I think that’s the right position, and now the hard work about how to translate that into a resolution goes forward. SECRETARY CLINTON: You know what? We’re not – we’re going to be just working over the next two days very diligently to follow up on this extraordinary Security Council session, and I’m not prepared to anticipate what is going to be the outcome. QUESTION: If I could try and follow up on that. I think you left no hint today – between your comments, the foreign secretary’s comments, and Foreign Minister Juppe’s comments, taken with a very tough statement by Ambassador Rice yesterday – that you think Russia is blocking movement by the Council. And over the last 48 hours, Foreign Minister Lavrov has publicly said that he doesn’t want to talk to you because he’s busy in Australia, and so clearly he’s skirting serious discussion with you directly on this issue. So what is all this chest beating here at the United Nations for if at the end of the day, the Russians aren’t going to meaningfully work towards a solution? Or are you concerned that you’ll have to water down this resolution so much that it doesn’t take into the spirit of the Arab League report that you endorse? 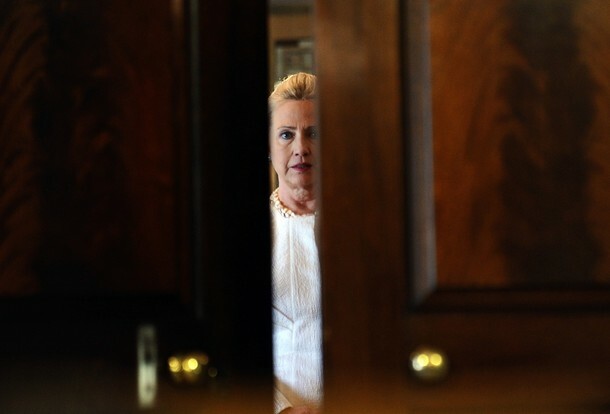 SECRETARY CLINTON: Well, first, Elise, I am going to be speaking with Sergey Lavrov. He is traveling in Australia. I’ve actually traveled in Australia. It is sometimes difficult to make connections. I don’t think anyone should read anything into that. I think what’s important is the resolve that has been demonstrated so clearly today by the Arab League and by a majority of the members of the Security Council that action is called for. There was a repeating of the chronology, starting with the presidential statement back in August, and the numbers of deaths continue to rise. So this is not sustainable. We have to make a very clear statement from the Security Council supporting the Arab League’s leadership and calling for a path forward that will be followed by the Assad regime. And obviously, the United States and I personally care deeply about what is happening in Syria. I also understand some of the doubts and concerns of the Syrian people, which I addressed directly today in my statement. If this were easy, it would have already been done. There are a lot of issues and concerns that have to be addressed. But at the end of the day, every member of that Security Council has a choice to make. If you do not choose to try to stand on the side of the Syrian people, then you are standing on the side of the continuing killing and abuses that are carried out every single day. I know what side we’re on. I know what side the majority of the Council is on, and we will work until we can find a way to usefully support the Arab League’s initiative, send a clear message to the Assad regime and the people of Syria, and then work toward a peaceful resolution of this terrible conflict. Thank you very much, Mr. President, and let me begin by thanking Prime Minister Hamad bin Jassim and Secretary General el Araby for their thorough briefing. The Arab League has demonstrated important leadership in this crisis. And for many months, the people of the region and the world have watched in horror as the Assad regime executed a campaign of violence against its own citizens. Civilians gunned down in the streets, women and children tortured and killed. No one is safe, not even officials of the Syrian Arab Red Crescent. According to UN estimates, more than 5,400 civilians have already died, and that number is rising fast. The regime also continues to arbitrarily detain Syrian citizens, such as the activists Yahia al-Shurbaji and Anas al-Shaghri, simply for demanding dignity and universal rights. To date, the evidence is clear that Assad’s forces are initiating nearly all of the attacks that kill civilians, but as more citizens take up arms to resist the regime’s brutality, violence is increasingly likely to spiral out of control. Already, the challenges ahead for the Syrian people are daunting – a crumbling economy, rising sectarian tensions, a cauldron of instability in the heart of the Middle East. Now, fears about what follows Assad, especially among Syria’s minority communities, are understandable. Indeed, it appears as though Assad and his cronies are working hard to pit Syria’s ethnic and religious groups against each other, risking greater sectarian violence and even descent into civil war. So in response to this violent crackdown on peaceful dissent and protest, the Arab League launched an unprecedented diplomatic intervention, sending monitors into Syria’s beleaguered cities and towns and offering President Assad many chances to change course. These observers were greeted by thousands of protestors eager to share their aspirations for their universal rights and also the stories of what had befallen them and their families. But as the Arab League report makes clear if you read the entire report, the regime did not respect its pledges or the presence of the monitors, and instead responded with excessive and escalating violence. Now, in the past few days, the regime’s security forces have intensified their assault, shelling civilian areas in Homs and other cities. And this weekend, the Arab League suspended its monitoring mission, pointing to the regime’s intransigence and the mounting civilian casualties. So why is the Arab League here before this Security Council? Because they are seeking the support of the international community for a negotiated, peaceful political solution to this crisis and a responsible, democratic transition in Syria. And we all have a choice: Stand with the people of Syria and the region or become complicit in the continuing violence there. The United States urges the Security Council to back the Arab League’s demand that the Syrian Government immediately stop all attacks against civilians and guarantee the freedom of peaceful demonstrations. In accordance with the Arab League’s plan, Syria must also release all arbitrarily detained citizens, return its military and security forces to their barracks, allow full and unhindered access for monitors, humanitarian workers, and journalists. And we urge the Security Council to back the Arab League’s call for an inclusive, Syrian-led political process to effectively address the legitimate aspirations and concerns of Syria’s people, conducted in an environment free from violence, fear, intimidation, and extremism. Now, I know that some members here may be concerned that the Security Council could be headed toward another Libya. That is a false analogy. Syria is a unique situation that requires its own approach, tailored to the specific circumstances occurring there. And that is exactly what the Arab League has proposed – a path for a political transition that would preserve Syria’s unity and institutions. Now, this may not be exactly the plan that any of us ourselves would have designed. I know that many nations feel that way. But it represents the best effects and efforts of Syria’s neighbors to chart a way forward, and it deserves a chance to work. I think it would be a mistake to minimize or understate the magnitude of the challenge that Syrians face in trying to build the rule of law and civil society on the ruins of a brutal and failed dictatorship. This will be hard. The results are far from certain. Success is far from guaranteed. But the alternative – more of Assad’s brutal rule – is no alternative at all. We all know that change is coming to Syria. Despite its ruthless tactics, the Assad regime’s reign of terror will end and the people of Syria will have the chance to chart their own destiny. The question for us is: How many more innocent civilians will die before this country is able to move forward toward the kind of future it deserves? Unfortunately, it appears as though the longer this continues, the harder it will be to rebuild once President Assad and his regime is transitioned and something new and better takes its place. Citizens inside and outside Syria have begun planning for a democratic transition, from the Syrian National Council to the courageous grassroots local councils across the country who are organizing under the most dangerous and difficult circumstances. But every day that goes by, their task grows more difficult. The future of Syria as a strong and unified nation depends on thwarting a cynical divide-and-conquer strategy. It will take all Syrians working together – Alawis and Christians hand-in-hand with Sunni and Druze, side-by-side Arabs and Kurds – to ensure that the new Syria is governed by the rule of law, respects and protects the universal rights of every citizen, regardless of ethnicity or sect, and takes on the widespread corruption that has marked the Assad regime. For this to work, Syria’s minorities will have to join in shaping Syria’s future, and their rights and their voices will have to be heard, protected, and respected. And let me say directly to them today: We do hear your fears and we do honor your aspirations. Do not let the current regime exploit them to extend this crisis. And leaders of Syria’s business community, military, and other institutions will have to recognize that their futures lie with the state and not the regime. Syria belongs to its 23 million citizens, not to one man or his family. And change can still be accomplished without dismantling the state or producing new tyranny. It is time for the international community to put aside our own differences and send a clear message of support to the people of Syria. The alternative – spurning the Arab League, abandoning the Syrian people, emboldening the dictator – would compound this tragedy, and would mark a failure of our shared responsibility, and shake the credibility of the United Nations Security Council. The United States stands ready to work with every member in this chamber to pass a resolution that supports the Arab League’s efforts, because those are the efforts that are well thought out, and focused on ending this crisis, upholds the rights of the Syrian people, and restores peace to Syria. That is the goal of the Arab League, that should be the goal of this Council, to help the Syrian people realize the goal of the future that they seek. Thank you. 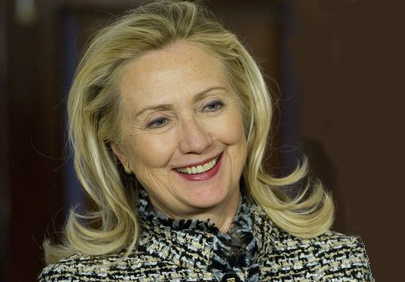 10:45 a.m. Secretary Clinton attends a Cabinet Meeting at the White House. Secretary Clinton travels to New York to attend a United Nations Security Council meeting on Syria. Secretary Clinton is accompanied by Ambassador to the UN Susan Rice, Assistant Secretary Esther Brimmer, and Director Jake Sullivan. PM Secretary Clinton holds a trilateral meeting with UK Foreign Secretary William Hague and French Foreign Minister Alain Juppe, at the United Nations in New York City. 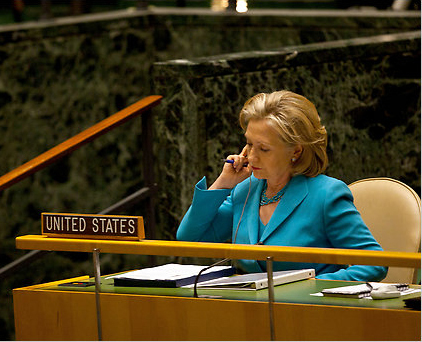 PM Secretary Clinton appears before the press, at the United Nations in New York City. This past year, we have seen Holocaust denial increasing throughout Europe, Asia, South America, and the Middle East. There has been an upsurge in anti-Semitic acts, including hateful graffiti, cemetery desecrations, verbal and physical assaults on Jews, incitement to anti-Semitic violence, and cartoons demonizing Jews. Denying the truth of the Holocaust is an insult to history. We urge governments, civil society leaders, clerics, human rights groups, and all people of conscience in all nations to speak out against this kind of hatred. The United States will work with all of those who are committed to a world free of anti-Semitism and all other forms of ethnic or religious intolerance. The United States condemns in the strongest possible terms the escalation of the Syrian regime’s violent and brutal attacks on its own people. In the past few days we have seen intensified Syrian security operations all around the country which have killed hundreds of civilians. The government has shelled civilian areas with mortars and tank fire and brought down whole buildings on top of their occupants. The violence has escalated to the point that the Arab League has had to suspend its monitoring mission. The regime has failed to meet its commitments to the Arab League to halt its acts of violence, withdraw its military forces from residential areas, allow journalists and monitors to operate freely and release prisoners arrested because of the current unrest. The Security Council must act and make clear to the Syrian regime that the world community views its actions as a threat to peace and security. The violence must end, so that a new period of democratic transition can begin. Tomorrow, I will attend a United Nations Security Council meeting on Syria where the international community should send a clear message of support to the Syrian people: we stand with you. The Arab League is backing a resolution that calls on the international community to support its ongoing efforts, because the status quo is unsustainable. The longer the Assad regime continues its attacks on the Syrian people and stands in the way of a peaceful transition, the greater the concern that instability will escalate and spill over throughout the region. 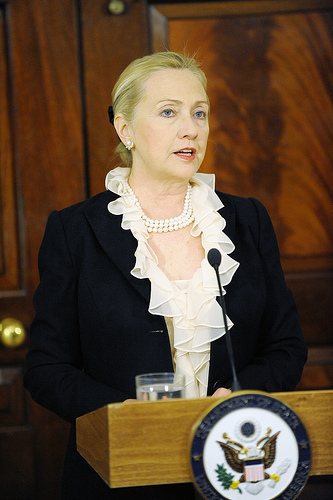 9:15 a.m. Secretary Clinton meets with the assistant secretaries, at the Department of State. 2:15 p.m. Secretary Clinton attends President Obama’s bilateral meeting Georgian President Mikheil Saakashvili, at the White House. This is unconfirmed by the State Department at the moment, however it appears reasonably reliable from Bloomberg. Secretary of State Hillary Clinton will attend a United Nations Security Council meeting Jan. 31 to show support for an Arab League plan to end the violence in Syria, an Obama administration official said. Clinton will push the 22-member group’s proposal for Syrian President Bashar al-Assad to step down in favor of a national unity government, according to the official, who was not authorized to speak on the record.